We have so, so much. It can blind us to people who have so, so little in places that are very different from here. That can be true of money, clothing, food, online shopping, two-day shipping, and on we could go. With such a vast array of resources at our fingertips, we might easily forget that it's not like this everywhere. This is also true of spiritual resources like solid churches with faithful preaching, good Christian literature, and sound theological education. There are many countries in the world where such things are almost non-existent. Countries like Serbia. You can get McDonalds and KFC there, and there's a Starbucks coming soon, but the spiritual condition of this nation is dire. Genuine evangelical Christians make up a minuscule percentage of the population. Evangelical churches are for the most part weak and led by poorly trained or untrained pastors. Spiritual discernment is lacking. But over here, even if we know Serbia is a country and can find it on a map (which...can we? ), we might not know or care about such realities. We have what we need, and so the spiritual plight of a little Balkan country thousands of miles away caries little concern for us. 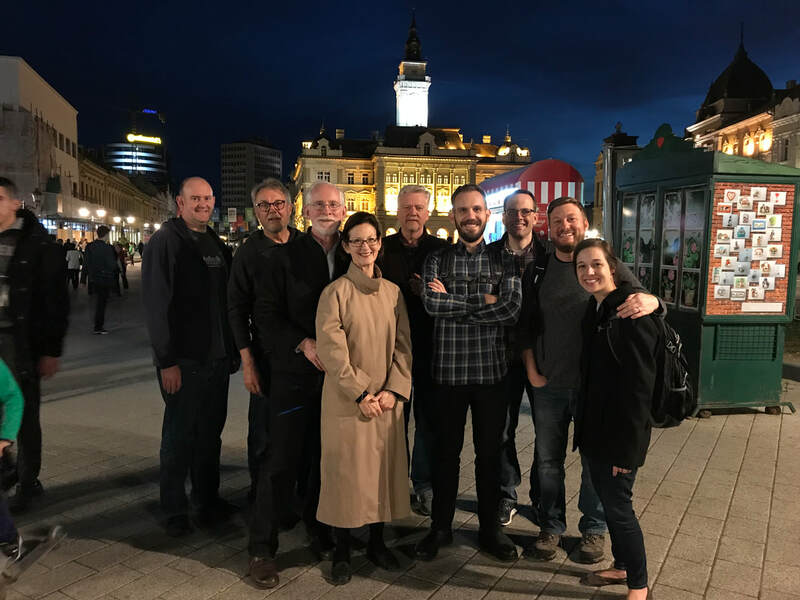 So it was for me before my friend (and my high school Sunday school church history teacher), Dwayne Baldwin, and his family went to Serbia to begin slowly, bit by bit, changing the spiritual landscape of a barren country. Dwayne, in partnership with Training Leaders International (TLI: Sending teachers. Training leaders. Strengthening the church. ), is doing the slow, painstaking work of revitalizing the Baptist Theological School in Novi Sad, Serbia. 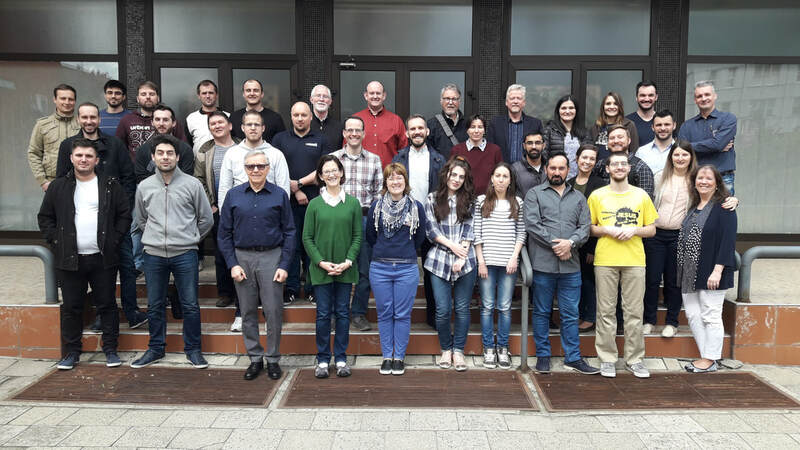 The goal of the school: A new generation of Christ-focused leaders in the Balkans. I got to see all of this first hand earlier in the month on a trip with TLI to teach at BTS in Novi Sad. While we may be oblivious, surrounded by piles of excellent theological books and sound churches, thankfully others are more in tune to the deep needs in other places around the world and are doing good work to meet those needs. Praise God for your church, for easy access to wonderful Christian writing (that can arrive at your door 2 days after ordering), for many options for sound theological education, for a wealth of spiritual resources. Ask me if you'd like to know more or see more pictures. As my stress level began to rise on a morning perusal of facebook, twitter, and the latest news with everyone overreacting to everything, it occurred to me that the answer for the Christian in troubled times is the same as the answer for the Christian in calmer times. It's both boring and brilliant at the same time. 1 Thessalonians 4:10b-12 "...But we urge you, brothers, to do this more and more, and to aspire to live quietly, and to mind your own affairs, and to work with your hands, as we instructed you, so that you may walk properly before outsiders and be dependent on no one." In the main, God has called his people to live ordinary lives, simply, diligently, consistently doing the work he has given them to do. What might that look like on an ordinary day? Love and care for your family. Point them to Jesus. Help them. Serve them. Fulfill your God-given role. Do your work for the day. Punch the clock. Make the bed. Do your school work. Change the diaper. Collect the garbage. Do the laundry. Perform the heart surgery (as I read this it occurs to me there are probably no heart surgeons reading this...ah well). Mow the lawn. Prep the sermon. Vacuum. Take the exam. Make dinner. Cut down the tree. Do the dishes. Reflect the light of Christ to the people you interact with every day. Go to bed and rest. How is that the antidote to the stressful times in which we live? It simply tells us what's next. We don't have to wonder. We don't have to worry about what's happening in Washington. Get up and do the next thing. How good of God to design us to work, to do, to be active, and to rest. He doesn't call us to days of emptiness and nothing to do except scroll through our devices and their never-ending stream of "urgent" news and notifications. He calls us to get up and do the work he's given us to do. The beautiful humdrum monotony of the very good day-to-day work God has called us to diverts our attention away from the things that tend to trouble us so. Pursue that with all of our hearts and we might just find we have more peace when turmoil rages all around. I have been preaching through the OT book of Proverbs at GBC. This week, I've been studying the tongue, the power of words, how we should speak, not speak, etc. And I am again reminded of just how current and relevant the Word of God is. Some would say the Bible is outdated and irrelevant. I contend just the opposite. Here's an example of why. Try applying these Proverbs to social media and today's public discourse in general. Proverbs 10:19 "When words are many, transgression is not lacking, but whoever restrains his lips is prudent." Proverbs 12:18 "There is one whose rash words are like sword thrusts, but the tongue of the wise brings healing." Proverbs 12:25 "Anxiety in a man's heart weighs him down, but a good word makes him glad." Proverbs 15:28 "The heart of the righteous ponders how to answer, but the mouth of the wicked pours out evil things." Proverbs 17:28 "Even a fool who keeps silent is considered wise; when he closes his lips, he is deemed intelligent." Proverbs 18:2 "A fool takes no pleasure in understanding, but only in expressing his opinion." Proverbs 18:13 "If one gives an answer before he hears, it is his folly and shame." Proverbs 20:3 "It is an honor for a man to keep aloof from strife, but every fool will be quarreling." Proverbs 21:23 "Whoever keeps his mouth and his tongue keeps himself out of trouble." Proverbs 29:20 "Do you see a man who is hasty in his words? There is more hope for a fool than for him." Outdated, irrelevant? Apparently not. We (including me) need this truth today! What are some of those reasons? Read below. These are admittedly snatched out of their contexts, but I'm including the references if you'd like to dig further and see that others before you have had reasons for fear too. But as David Powlison notes, though we do have reasons for fear, we have greater reasons to not fear. Here are some of them. ​Lots of good comfort there and that's not all. Do some of your own digging and you may find more, find repeats of some of these, and don't forget to look for the places where the assurance precedes the command not to fear. May God give us grace to trust him and take him at his word. Peace and Quiet or Anxiety and Noise? I started writing this post about David Powlison's article, "Peace, Be Still: Psalm 131" from his book, Seeing with New Eyes. In it, he explains that short, 3-verse Psalm in a way that helps us come to grips with what might be keeping us from peace. I commend the article to you. You may not agree with everything, but I think it will stir you to think and God may well use it to help you move from a noisy soul to a more quiet soul. I started to type out his translation of Psalm 131 alongside what he calls its "anti-psalm." It is a helpful way of considering the sources of noise and stress and anxiety in our lives and our need to rest quietly in God's faithful hands. But as I was typing it, I decided to do a search of the blog to see if I had done this before. Sure enough, I found this post from 2013. So click on over if you're trying to diagnose the noise and lack of peace in your life and maybe you'll find some help. Welcome to the new GBC website! We've done a refresh on the site. Most of the content is the same as or similar to what was here before. But the design and the way some things are arranged are new. You'll find the menu in the upper right and it should stay visible as you scroll down the page. There's also a footer at the bottom of each page where you can navigate to different pages on the site. Our meeting times are now front and center on the home page, but you can also find them on their own page under "about." About that "about" page. There you can find a little bit of everything - who we are, our history, location, service times, and more. You can locate sermons either by date or by sermon series, and right on the home page is link to the most recent message: easy to get to if you miss a week and want to catch up. There are also some neat touches that tie the site with our building. See if you can find them. And if you're reading this, you've found my infrequently updated blog. ​So have a look around and see what you think. Not everything is complete, but we're working on it. If you have any comments, ideas, or suggestions, feel free to drop them in the comments below. A huge thanks to Ben Hueni who donated his time and expertise to help us update the site! May it be used for the glory of God and the good of the church! Isaiah 26:3 "You keep him in perfect peace whose mind is stayed on you, because he trusts in you." Philippians 4:8-9 " Finally, brothers, whatever is true, whatever is honorable, whatever is just, whatever is pure, whatever is lovely, whatever is commendable, if there is any excellence, if there is anything worthy of praise, think about these things. What you have learned and received and heard and seen in me-- practice these things, and the God of peace will be with you." Simple enough. Keep my mind fixed on him and think on what is good. So why am I not at perfect peace? Why does it too often seem like the God of peace is not with me? Turns out it's easier to keep my mind fixed on other things. Two hour movie - check. Baseball - check. Mindless social media scrolling - check. But you know what cuts through even sports and entertainment for me? I can focus laser-like on suffering and anxiety or the two combined. I can think about my suffering and misery and be afraid all through the day and wake up thinking about them at night. If I would fix my mind on Jesus like I do on my anxiety, I imagine I'd be a lot closer to the realities described in Isaiah 26:3 and Philippians 4:8-9. Talk to yourself, don't listen to yourself. Fight the lie with the truth. That's really good advice, and I stand by it, but turns out it's really hard (which I actually talk about in that post linked above; I apparently need another reminder). With the sin remaining in my heart, it is still a battle to incline my mind toward the things I know to be true; to keep my mind fixed on God. It is easier to let anxiety and fear wash over me. It's easier to meditate on my suffering and wallow in self-pity and despair. So we find it's a battle to keep focus to pray. It's a war to read carefully God's Word. It's a struggle to meditate on the truth found in God's Word. It's hard to lay in bed and silently recite Scripture (not to mention memorizing it in the first place). The Bible talks about spiritual warfare for a reason. It's not just a neat metaphor for the Christian life. It is the reality of the Christian life. I think most believers would generally agree that we have various roles and callings to fulfill in our lives, and those must be prioritized. We could obviously break things down much further or make a bit different list for single Christian students (or any other demographic), but there's a basic priority list for our callings as followers of Christ. Then whatever time is left over, we could spend on leisure (hobbies, reading, sports fandom, etc), other pursuits, or focusing in on various emphases within the callings above. So how do we do that? Isn't God good to give us such a variety of desires and gifts to be used for his praise as we walk through this world! In some ways, it might be great if we could all go all-in on all of those things and more we haven't mentioned. But the reality is that you and I are gifted differently and have finite amounts of time, energy, and resources. That means we can't do all of those things, and we shouldn't feel guilty about that. If you don't go to another country and tell people about Jesus, it doesn't mean you've violated Matthew 28:19-20; there are other ways to have a role in fulfilling the great commission. If you don't lobby for pro-life legislation, it doesn't mean you've broken the 6th commandment. If you don't adopt a child it doesn't mean you've run afoul of James 1:27. If you don't throw a block party it doesn't mean you've failed to love your neighbor. Not everyone will be able to give the highest emphasis to each of these areas. But they can participate in other ways that fulfill God's calling on our lives to preserve life, spread the gospel, love the orphan and widow, etc. Some will be all-in on one area. Some will be in at a certain level on various areas. But we can't do it all to the max. And that's ok. Now, if you have no heart for the widow or orphan or missions or evangelism or the preservation of life at every stage, that's not ok. But there are different Biblical ways to express that heart. Given those realities, here are a few suggestions on how we relate to and view one another in our various pursuits as we follow Christ. Be passionate about your pursuit! What God has given you a heart and giftedness for, go after with all of your heart! Encourage others in their pursuits. Praise God for their labors in their chosen sphere of emphasis for the cause of Christ. If you're not all-in in a particular area, you can help someone who is. Understand that not everyone will be passionate about your pursuit. That doesn't make them less of a Christian. It doesn't mean they don't care about what you're doing. It means God has given them different desires, different calling, or put them at a different place in their life. Because someone engages in your particular passion in a way that is different or less involved than you doesn't make them a lesser Christian or give room to look down on them. Don't assume you know why someone does what they do or why they don't do what you do. We don't know all of people's stories. Assuming we do can lead to unfounded, hurtful conclusions. If someone isn't vocal about what they do, it doesn't necessarily mean they're not doing anything. If we all gave max effort in every noble, worthy, God honoring cause, most of us would burn out and not get much done. Praise God for the diversity he has given us in the body of Christ and that so much good is being done by so many people in so many different areas. But some truly aren't doing anything or enough. If that's you or me (and it's not due to legitimate limitations), it may be time to think about reallocating some time and effort towards greater usefulness in the Kingdom of God. Don't use this post as a justification for laziness or sin. Learn what people are passionate about and why and see what aligns with your own gifts and desires and get after it. For those of us that do battle with fear and anxiety, here are some quick helps to fight the fear that so easily rises in our hearts. The thing is, I know these things, but sometimes still fail to make use of them when fear strikes (or lurks or operates at a low grade). So I need a reminder and thought I'd share it with you. These are not meant to be detailed; just a quick list of strategies, possible places to turn, and things to think about. You can dig further into them by reading the resources/authors noted, and for some of them I've linked where I've written about them in more detail. But remember that just knowing them won't help much unless we put them to use by God's grace. First a few helpful resources from which some of these thoughts are drawn. Men like Ed Welch, D. Martin Lloyd-Jones, my dad, and others have been a great help to me in understand how God's Word applies to my fear. The Bible (obviously, but maybe our neglect of this resource shows that it's not so obvious as it should be) Here's a nice online, searchable version. The presence of God. Hebrews 13:5b-6 "...for he has said, 'I will never leave you nor forsake you.' So we can confidently say, 'The Lord is my helper; I will not fear; what can man do to me?'" Joshua 1:9 "Have I not commanded you? Be strong and courageous. Do not be frightened, and do not be dismayed, for the Lord your God is with you wherever you go." What would you add? The next time fear strikes, may we be ready to fight it off and not give in. I remember when my dad turned 40. There was a surprise party, some surreptitious doings to keep him from finding out, and (if I recall correctly) he was actually surprised. I don't remember if I thought then about my own eventual arrival at the age of 40. I kinda doubt it. I was 11. As they say, youth is wasted on the young, and I don't imagine I was far sighted enough at the time to contemplate the years intervening childhood and 40hood. I'm thinking about it some now though. Today is my 40th birthday. It's a bit surreal to remember a milestone like that and now to pass it myself. But 40 is here, ready or not. And if the law of averages holds for me, I'm over half way done with life. Average life expectancy for a male in our country is 77.5 years (depending on where you look; that's CIA data for 2016). So anyone wanting to needle me for being over the hill, that ship has sailed. I went over the hill at 38.75 years, around May of 2016! I am learning more of what it means to really and truly depend on God. For a lot of my years I thought I was depending on God until God brought me to an end of myself. I have spent too much of my life depending on me and my skills and job and connections and bank account and friends and family, etc instead of on the God who gives those gifts. Still learning. I have wished that God would show me the plan for my life all at once; a complete road map, no surprises, always knowing what's next. But by guiding me only one step at a time, God has taught me things that I likely wouldn't have learned if I knew it all up front. This is sometimes painful and always good, whether it feels that way or not. God gives enough grace for each day. Don't borrow trouble from tomorrow. Don't borrow trouble from tomorrow. Don't borrow...anyway. You get the idea. Still working on this one. The grace for tomorrow's trouble will come tomorrow. Family is sweet. Especially my wife. I hope she is with me every year on the backside of 40. I wish that I had used my time better and am thankful to have been learning slowly in the last few years how to be more productive and less lazy. I still need lots more discipline and growth in this area. The bigger question, the one I can do something about is: What will I do with what's left? I know that, no matter what, the faithfulness of God that I have experienced the last 40 years will follow me all the days of my life and then I'll dwell in the house of the Lord forever and ever, Amen. I want to keep my eyes fixed on that reality and the Savior who has provided it for me. I want to be faithful to my calling as a follower of Christ, a husband, a father, and a minister of the gospel. God give me grace to finish well over the course of the years that remain. My dad isn't 40 any more, but he is still faithful to his Savior and has left in his wake a crowd of people who are the better for having known him. Including me. And my sons. And if, when my sons turn 40, the same can be said of me, I'll be grateful.